Dungeon Drift is a combination of the rouguelike and racer genres. 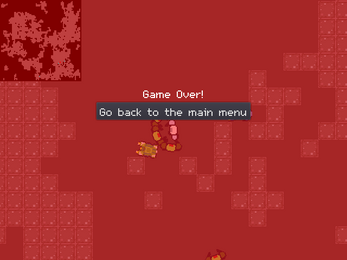 In this game, your goal is to escape the dungeon as quickly as possible, both on foot and in cars that you find throughout the map. To help you do this, you’re given a live-time minimap, which shows your location (flashing red), the cars’ locations (cyan) and the exit location (flashing green). WASD or Arrow keys controls your movement for both the player and the car. However the player and the car handle differently - you have to steer the car. Space bar pulls you in and out of a nearby car. Tab toggles the minimap on and off. Dungeon Drift generates levels automatically each time you play, so no two times are the same. Sometimes backtracking to get a car might be a good idea, other times going on foot may be faster. Once you complete a level, the game will display your total time, which constitutes your final score.